Over 175 students, job seekers, family members, educators, and other professionals attended a unique conference at Bellevue College, “Autistics Present: A Symposium on Autistic Culture, Identity, and Transition”. Every presenter was autistic, allowing them to bring their in-depth experiential and professional knowledge to a broad range of topics, including the creation of supportive and inclusive spaces for autistic women, autistic identity and culture, Microsoft’s autism hiring program, and more. 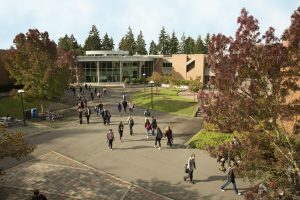 The symposium was developed through a partnership between Bellevue College’s Autism Spectrum Navigators program and the Autism Women’s Network. There were two workshop tracks, one focused on identity and culture, and the other focused on transitioning from high school through college and into careers. Employers are increasingly expanding their efforts in diversity recruitment to include people with different abilities. In the article “What if a Company Maximized Jobs Over Profits?” published in the Harvard Business Review (March 20, 2014), job entrepreneur Dave Friedman said he believed “people on the autism spectrum represent an exceptional yet hidden workforce.” He found that people on the autism spectrum had a competitive advantage for “labor-intensive activities such as website maintenance, data entry, and software testing,” roles that companies were often hard-pressed to fill. His company AutonomyWorks was designed to fill that gap, connecting employers and autistic people to their mutual benefit.